You and your everything are getting married! Send this cute wedding invitation to guests so they know all the details of your special day. Fun buds bloom from the top and highlight your wording on this wedding invitation. Choose your ink colors to make it special. Go boho chic! The pretty flowers and geometric pattern on this wedding invitation are accented with your choice of colors and foil accents. 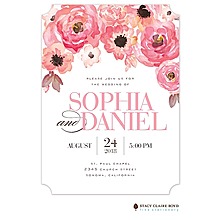 Your choice of foil and ink colors make this whimsical best day ever posies wedding invitation shine. Love flowers? You can have it all at a price you can afford with the floral design on this ValStyle wedding invitation. When your woodsy wedding has a delicate style, this fern and floral design wedding invitation is the perfect way to introduce it. Foil accents make it glisten. Rustic chalkboard style gets a little bit glam with a gold foil border and canning jar design on this wedding invitation. The sweetest of watercolor posies bloom just in time for your wedding on this shimmer invitation set. You get all three pieces for one affordable price!